Following four straight seasons of not rising above .500, the Los Angeles Raiders had gotten off to a 6-1 start in 1990. However, Head Coach Art Shell’s team had then lost three of four prior to facing the Denver Broncos on December 2. Sixth-year QB Jay Schroeder was showing great improvement under the guidance of assistant coach Mike White and the offense featured an outstanding running attack. Due to the contractual arrangement that allowed him to join the Raiders after the major league baseball season was completed, RB Bo Jackson (pictured above) had been increasing his workload as he split time with veteran RB Marcus Allen in the five previous games. The Denver Broncos, under Head Coach Dan Reeves, were at just 3-8 a year after winning the AFC title and being decimated by the 49ers in the Super Bowl. 30-year-old QB John Elway was the key to the offense and had a talented group of receivers for his passes. Second-year RB Bobby Humphrey was highly productive. But the defense was prone to giving up too many points, particularly in the second half of games. It was a sunny and bitterly cold day at Mile High Stadium with wind chills in the teens. The Broncos had first possession and drove 45 yards in eight plays with Humphey running for 38 yards and David Treadwell kicking a 45-yard field goal. Los Angeles responded with a long 13-play drive that covered 73 yards and used up over nine minutes. 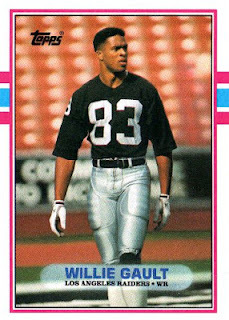 Marcus Allen handled the running and Jay Schroeder completed four passes to WR Willie Gault, the longest two of which covered 22 and 19 yards. Schroeder finished off the series with a four-yard TD pass to RB Steve Smith and, with Jeff Jaeger’s successful extra point, the Raiders were ahead by 7-3. Heading into the second quarter, the teams traded punts. Taking over at their own four yard line, the Broncos put together a long drive of their own. Along the way Elway threw to WR Mike Young for 14 yards on a third-and-five play and ran 19 yards for a first down in a third-and-15 situation. Denver took 12 plays to go 96 yards and regained the lead when Elway completed a 21-yard scoring pass to WR Vance Johnson. It was 10-7 at the half. The Raiders had the ball first in the third quarter and punted, but they regained possession two plays later when CB Terry McDaniel intercepted a poorly-thrown Elway pass and returned it to the Denver 28. Schroeder threw to Gault for 17 yards and Bo Jackson, who had carried just twice at the end of the first half, ran for an 11-yard TD. LA was back in front by 14-10. Once again the Broncos put together a long series that extended into the fourth quarter. And again Elway made big plays on third down, most notably hitting WR Ricky Nattiel for a 19-yard gain on third-and-12. But after getting a first down at the LA 9, Denver had to settle for a 21-yard field goal by Treadwell to complete the 17-play, 73-yard drive and make it a one-point contest. The clubs traded punts with the Raiders taking over at their 38 yard line and striking quickly as Jackson took off down the left side for a 62-yard touchdown. The extra point attempt was blocked afterward – an occurrence that would factor into the game’s outcome. But it seemed inconsequential when a three-and-out series by the Broncos led to a methodical scoring possession by Los Angeles and Jaeger booted a 46-yard field goal to extend the margin to ten points with 4:18 left on the clock. Operating exclusively out of the shotgun, Elway and the Broncos came out throwing. Young caught four passes, including the last one of the series for an eight-yard TD. The successful PAT made it a three-point contest and Denver had one more shot after a short LA series and punt. Taking over at their 40, the Broncos got a break when a catch originally ruled out of bounds was overturned on review and became a 27-yard Elway completion to Johnson. Advancing to the Los Angeles 24, it seemed as though the contest was about to go into overtime. But with ten seconds on the clock, the snap was high for Treadwell’s 41-yard field goal try and the kick was deflected. The Raiders won by a score of 23-20. The Broncos had more total yards (357 to 293) and first downs (20 to 17). They also surrendered the only turnover of the game – which led to Denver points – and were more heavily penalized (8 for 54 yards to LA being flagged four times at a cost of 30 yards). 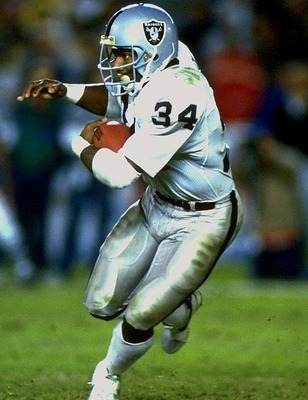 Bo Jackson, despite not appearing until late in the second quarter and splitting time with Marcus Allen, rushed for 117 yards and two touchdowns in just 13 carries. Allen was held to 22 yards in 11 attempts. Jay Schroeder completed 16 of 23 passes for 164 yards with no TDs or interceptions. 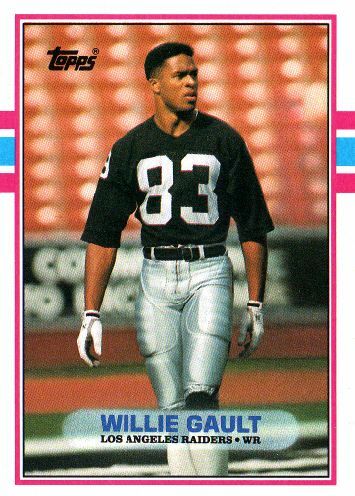 Willie Gault led the LA receivers with 9 catches for 99 yards. For Denver, John Elway was successful on 20 of 31 throws for 231 yards with two touchdowns and an interception. He also rushed for 52 yards on 7 carries. Bobby Humphrey was the top ground-gainer with 88 yards on 20 rushes. Mike Young caught 6 passes for 72 yards and a touchdown. The win allowed the Raiders to retain a share of first place in the AFC West and they went on to win the remainder of their regular season games and finish atop the division with a 12-4 record. After beating Cincinnati in the Divisional round of the playoffs, they were humiliated by Buffalo in the AFC Championship game by a lopsided score of 51-3. Denver split its remaining contests to place last in the division at 5-11. Despite playing in just 10 games, Bo Jackson led the Raiders in rushing with 698 yards on 125 carries to average 5.6 yards per attempt. He was selected to the Pro Bowl, but a hip injury suffered in the postseason proved to be career-ending. John Elway, immensely talented but prone to inconsistency, was among the league leaders in pass attempts (502), completions (294), and yards (3526) but tossed just 15 touchdown passes – the fewest since his rookie year in 1983 – and was intercepted 14 times. Bobby Humphrey rushed for 1202 yards and was selected to the Pro Bowl, but a contract holdout virtually wiped out his ’91 season and he was dealt to Miami.